It was my navratri fast today, so I was in no mood to cook anything. 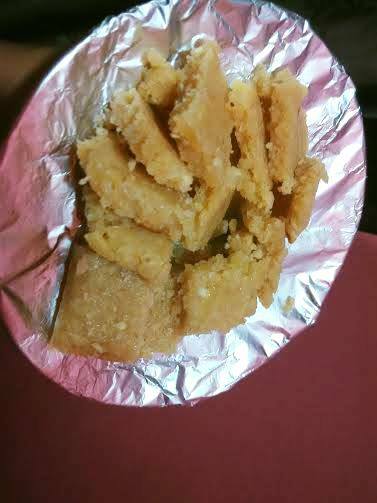 All I was able to make was navratri special sweet - badaam burfi. When hubby says this is the best almond fudge he has ever had, what more can I say? Almonds are power-packed nuts - rich in calcium, dietary fiber, proteins, and magnesium. Almonds benefit health in numerous ways. Health benefits of almonds have been a matter of discussion for centuries, with no controversies whatsoever. Eat them raw or toasted; flakes or sliced, slivered or floured or simply turn them into almond milk or almond butter. Believe me or not, almond butter makes a great substitute to clarified butter. I have tried an almond butter cake, without adding a single drop of oil or butter and it turned out amazingly delicious.This delicious cake was ready in 2 minutes. yes, this was a mug cake. You might also want to try almond butter whole wheat cake. You may also make almond butter kulfi, which is seriously healthylicious and does not use cream or sugar! Almond butter does the magic here while honey adds subtle sweetness to this seriously addictive kulfi. 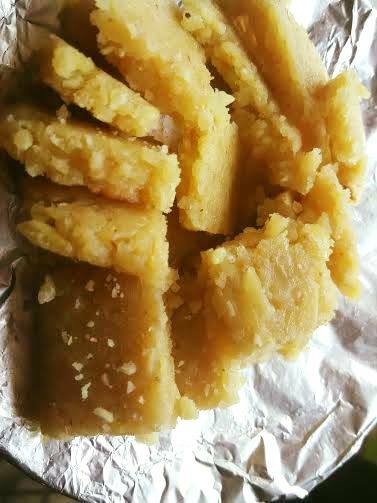 Trust me, the almond butter kulfi sans oats makes a delicious navratri recipe. Almonds come with several health benefits. Unlike other types of nuts that are high in bad cholesterol, almonds raise good cholesterol levels. Try this health food and you will fall in love with the recipe! According to a study published in the American Dietetic Association Journal, almonds raise vitamin E levels in the red blood cells and plasma. The study also claims that almonds for cholesterol are really beneficial and help in lowering LDL while raising HDL levels. The nuts help improve blood lipid levels and are thus great for the heart functioning. Another study published in the Cancer Letters claims that almonds may help reduce colon cancer risk. In fact, eat almonds regularly to boost your body's cancer'fighting properties. Of course, you cannot change your genes, but you certainly can alter the behavior of genes with the type and amount of food you eat. Though almond benefits outnumber their side effects, if you are allergic to nuts, avoid consuming them. Click here to go to almond-gur chikki recipe, which is another navratri special snacking option. Whether you are looking for navratri recipes or everyday snacking options, this almond fudge recipe is not to be missed. 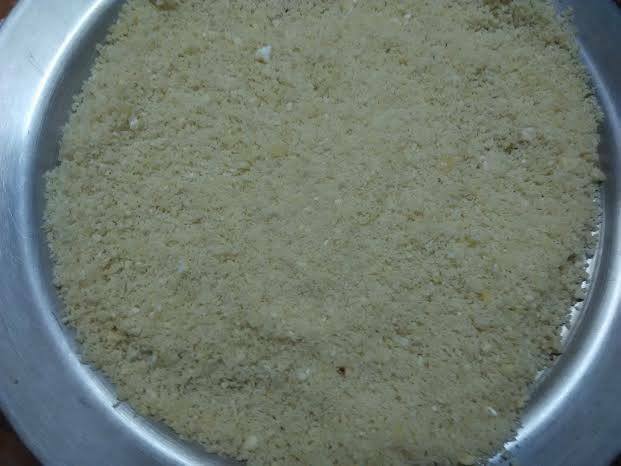 A delicious way to consume the power-packed almonds, this navratri sweet recipe is perfect way to enjoy the benefits of almonds. We need to make almond meal. Soak almonds in hot water for 5-8 mts. Peel their skin and let them dry. You can do so naturally by keeping them in sunlight for whole day or dry them on gas burner in a heavy bottomed pan. I had no time for sundrying, so did the same on stovetop in kadahi. Just dry roast peeled almonds. Let them cool down so that there is no moisture left. Your almond meal is ready. Add the almond meal to condensed milk. When the mixture starts to become a mass, add sugar and give it a good stir. Keep stirring until the mixture thickens and a mass is formed. Knead it well. I used a spatula to do so. Put the almond dough on the plate, press it with a heavy utensil. I used my marble circular board (chakla) to press the dough. Let it remain under the circular board for half an hour. 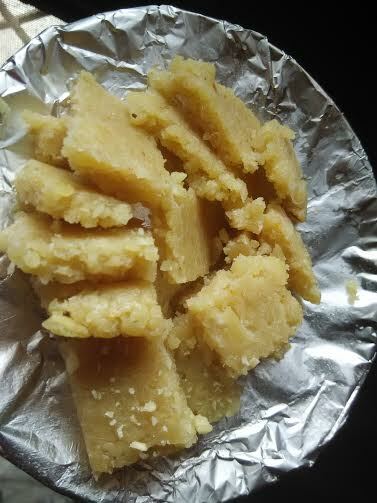 It will be easier to cut the burfi into different shapes.